On Friday 18 March, CCF Queensland is giving civil contractors from across the state the opportunity to engage with thought-leader speakers providing an outlook for the industry and present on how infrastructure is adapting to technological change, diversity and innovation. First and foremost, you need to pre-register to attend. Ticket sales close today, Friday 11 March, for both CCF members and non-members. Remember, there’s no better place than a conference to take stock of the state of your industry and your profession. It's time act fast and snap up the last remaining tickets. Buy tickets here! 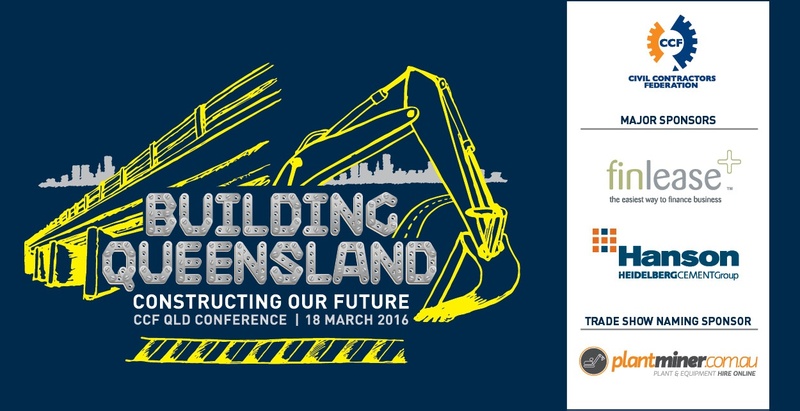 If you've already taken a look at the CCF QLD Conference program, you'll know it's packed with real project insights and initiatives for attendees (if you haven't had the chance yet, catch up on our recent blog CCF QLD Conference 2016: 11 speakers you won't want to miss). So what can be done to make sure you get the most out of the event as an attendee? This post will break down the ways everyone can squeeze every last ounce of ROI out of in-person events like the CCF QLD Conference. When people think about attending an event, one of the first things they think of is the networking possibilities. But networking is much easier said than done. If you're not sure where to start, begin with the basics -- just ask what company they are from and what their job is. Then move on to talking about projects in progress that might be interesting based on what your roles have in common. Close out the conversation by asking if you could keep in touch for the future, and explain how they would benefit from the relationship. Not everyone carries business cards anymore, but don't let that stop you from asking for one to make staying in touch easier. Then after your conversation closes, jot down some notes on the back of their business card so that you remember the highlights of your conversation and can follow up in a meaningful way once you get home. Prospects: Don’t count on simply running into prospects at the conference. Instead, reach out to them ahead of time to let them know you’ll both be in attendance. This way, you can book time on their calendars and have their full, undivided attention instead of trying to cram a 15-minute conversation into a stop-and-chat. Don’t go into these meetings expecting to close deals on the spot. Like you, your prospects are attending this conference to learn and gain expertise. Use these conversations to set yourself up for future targeted conversations addressing specific pain points or questions. Close each conversation with a list of takeaways, and let prospects know you’ll be following up with relevant materials. Customers: Sure, you might have exchanged emails with your customers in the last few months, but nothing beats a face-to-face interaction. If things aren’t going so well, this is a great opportunity to address any issues and if things are going well, checking in will not only reinforce your relationship -- it’ll also be fun! Enjoy spending time with a happy customer, and listen for upsell opportunities. Conference sessions, especially those that present case studies, offer fantastic, actionable ideas about how to improve your business. There is also generally time for Q&A's with presenters, so make sure you take the opportunity to get feedback on some of the key issues you're facing within your business. Take advantage of this and learn from the experts! It's easy to waste money on events if you don't have a goal in mind about what you want to achieve from your attendance. Before you go to an event, set that goal -- it could be making 5 new connections for business development opportunities, or even finding a new employee. As you go to the sessions, sponsor areas, and networking events, keep your eye on the ball to achieve that goal, and take notes on what actions you will take when you get back to the office. One of the reasons events are so great is the opportunity to learn about new topics and subjects. When PlantMiner team members attend events, for example, we get excited to learn about upcoming projects for our suppliers and new advancements in technology. So when you hear mention of something new at events, set a task for yourself to learn more about the topic. This could mean networking with a thought leader that you met at the event. The lessons you learn should not stop once the conference concludes! How do you make the most of the events you attend? Share your tips with us in the comments! P.S PlantMiner is the TradeShow Naming Sponsor - make sure to come over and say hello to any PlantMiner team member you see in the Trade Show Hall or spot throughout the day!